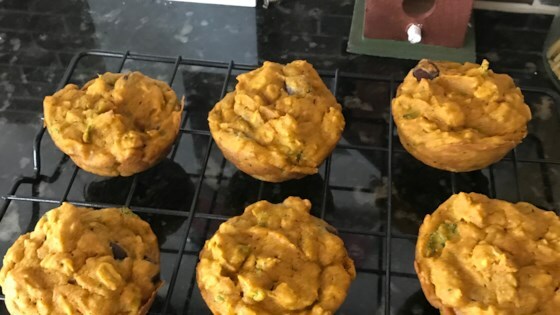 "These sanity-saving, healthy toddler muffins are packed full of veggies and other goodness, but still taste good enough to snack on yourself! Perfect for a starter finger food, or a self-contained meal for the more independent eater." Preheat oven to 350 degrees F (175 degrees C). Grease 2 muffin tins or line with paper liners. Combine pumpkin, eggs, olive oil, and maple syrup together in a large bowl; mix thoroughly. Combine flour, oats, baking powder, baking soda, cinnamon, and nutmeg in a small bowl. Stir into egg mixture. Add spinach and stir until evenly dispersed in the batter. Spoon batter into the prepared muffin tins, filling the cups 2/3 full. Bake in the preheated oven until a toothpick inserted into the center comes out clean, about 20 minutes. Cool for 10 minutes before removing from the tins. Let cool to room temperature, about 20 minutes. Substitute rice flour for the whole wheat flour if desired. Substitute applesauce for the olive oil if desired.